There are, of course, many ways to reach the Danish capital (Bus, Train, Plane…), but the most scenic is definitely the short ferry ride (about 45 min) from Germany to Denmark – given you travel on a sunny day! A Royal Affair (2012) is one of my favourite films ever! Even though a lot of scenes were actually filmed in the Czech Republic and even Dresden, Germany, the real royal scandal took place right here in and around Copenhagen. Unfortunately, I didn't have time to visit the settings of the tragic affair myself as you obviously need more than 72 hours in Copenhagen. 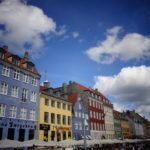 If you stay for longer and are interested in historical films, you can trace the captivating story of the unfaithful Danish Queen, her German lover and the mad king on a self‐guided film location tour put together by VisitCopenhagen. For those who have even more time, check out the film locations of The Danish Girl, The Bridge and Borgen or take a guided tour at the nearby film studio of Nordisk Film. The cinema is always a good idea on a rainy day, especially because in Scandinavia, nearly everywhere you go foreign films are shown in their original language (which is one reason why Scandinavians are so incredibly good at speaking English). I passed by this colourful Cinema Palace (Palads Teatret, Axeltorv 9), which currently also shows the captivating German drama 13 Minutes – the true story about a brave carpenter who tried to kill Hitler in the 1930s. Just strolling through the streets of the city centre and marveling at all the beautiful historic houses is an experience in itself. And the best thing: That's absolutely FREE! To get a good overview of all there is to see in the city, I recommend Sandeman's FREE Walking Tour. If you liked the tour, you can tip the tour guide at the end, but it's not compulsory (although recommend because they are doing a fab job). 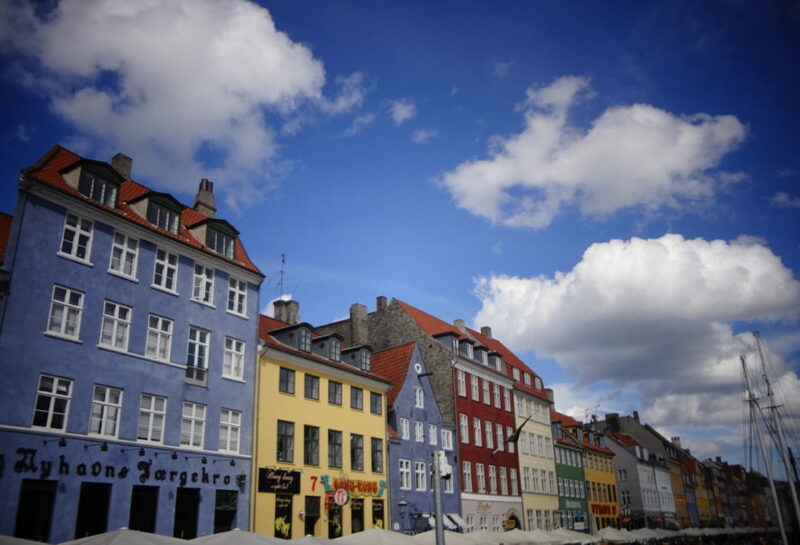 During the tour, you will visit places such as Nyhavn, Copenhagen's famous harbour with all those cute colored houses (which I learnt on the tour are former brothels). If you visit on a sunny Saturday, I may be really busy as you can see on my picture. All other days should be fine though. Added bonus: The tour finishes at the Amalienborg Castle, from where it's only a short (about 10 min) walk to THE must‐see of Copenhagen: The Little Mermaid! The one symbol that Copenhagen is famous for is of course the Little Mermaid statue. To my surprise, it was closer to the city centre and less crowded with tourists than I thought. I visited in the late afternoon / early evening just after the FREE walking tour had finished. I would recommend anyone to look for the Mermaid after you've been on the FREE walking tour as it's a bit difficult to find it otherwise. Plus, the tour guide will tell you lots of interesting anecdotes about the Mermaid's fairy tale author and Danish national hero Hans Christian Andersen. Accommodation is very expensive in Copenhagen. Thus, I chose AirBnB. I stayed in a residential area (Osterbro), which was a little bit outside the city centre, but still had very good metro and bus links from the metro stop Ryparken. I was at the main train station in about 20 minutes, which I think is really central after all. Plus, I had a room, a desk and a good Internet connection all to myself, which are three great benefits of staying in an AirBnB. A good and affordable all veggie Buffett can be found at RizRaz (St. Kannikestræde 19). The so‐called "Frokostbuffet" is available from 11:30 to 16:00. For 89 Danish Kronars you can eat as much veggie salad, pizza, bread and lasagna as you like! Not bad for a city as pricey as Copenhagen, right? Over to you: Got any more cool Copenhagen tips? Let me know in the comments below! Disclosure: I received no financial funding for this trip. All opinions expressed in this blog post are therefore entirely my own, personal and unbiased.